Jaipal-Jamani, K. & Figg, C. (2015). A Case Study of a TPACK-Based Approach to Teacher Professional Development:Teaching Science With Blogs. 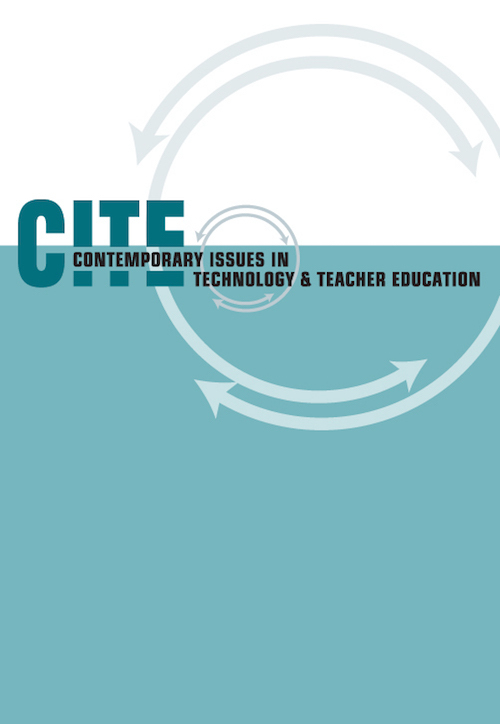 Contemporary Issues in Technology and Teacher Education, 15 (2), 161-200. Waynesville, NC USA: Society for Information Technology & Teacher Education. Retrieved April 18, 2019 from https://www.learntechlib.org/primary/p/148462/. Angeli, C., & Valanides, N. (2009). Epistemological and methodological issues for the conceptualization, development, and assessment of ICT-TPCK: Advances in technological pedagogical content knowledge (TPCK). Computers and Education, 52(1), 154-168. Appleton, K. (2008). Developing science pedagogical content knowledge through mentoring elementary teachers. Journal of Science Teacher Education, 19(6), 523-545. Brownstein, E., & Klein, R. (2006). Blogs: Applications in science education. Journal of College Science Teaching, 35(6), 18-22. Darling-Hammond, L. (2012). Powerful teacher education: Lessons from exemplary programs. San Francisco, CA: John Wiley& Sons. Davis, F.D. (1993). User acceptance of information technology: System characteristics, user perceptions and behavioral impacts. International Journal of Man-Machine Studies, 38(3), 475-487. Deng, L., & Yuen, A.H. (2011). Towards a framework for educational affordances of blogs. Computers& Education, 56(2), 441-451. Du, H.S., & Wagner, C. (2006). Weblog success: Exploring the role of technology. International Journal of Human-Computer Studies, 64(9), 789-798. Ferdig, R.E., & Trammell, K.D. (2004). Content delivery in the ‘blogosphere.’ THE Journal, 31(7), 12-20. Glazer, E., Hannafin, M.J., Polly, D., & Rich, P. (2009). Factors and interactions influencing technology integration during situated professional development in an elementary school. Computers in the School, 26, 21-39. Glazer, E., Hannafin, M.J., & Song, L. (2005). Promoting technology integration through collaborative apprenticeship. Educational Technology Research and Development, 53(4), 57-67. Grove, K., Strudler, N., & Odell, S. (2004). Mentoring toward technology use: Cooperating teacher practice in supporting student teachers. Journal of Research on Technology in Education, 37(1), 85-109. Hargreaves, A. (2003). Teaching in the knowledge society: Education in the age of insecurity. New York, NY: Teachers College Press. Harris, J.B., Mishra, P., & Koehler, M. (2009). Teachers’ technological pedagogical content knowledge: Curriculum-based technology integration reframed. Journal of Research on Technology in Education, 41(4), 393-416. Higgins, T.E., & Spitulnik, M.W. (2008). Supporting teachers’ use of technology in science instruction through professional development: A literature review. Journal of Science Education and Technology, 17(5), 511-521. Huffaker, D.A. (2005). The educated blogger: Using weblogs to promote literacy in the classroom. AACE Journal, 13(2), 91-98. Hughes, J. (2005). The role of teacher knowledge and learning experiences informing technology-integrated pedagogy. Journal of Technology and Teacher Education, 13(2), 227-302. Hung, H.T., & Yeh, H.C. (2013). Forming a change environment to encourage professional development through a teacher study group. Teaching and Teacher Education, 36, 153-165. Jaipal, K., & Figg, C. (2011). Collaborative action research approaches promoting professional development for elementary school teachers. Educational Action Research, 19(1), 59-72. Jaipal-Jamani, K., & Figg, C. (2013). The TPACK-in Practice Workshop approach: A shift from learning the tool to learning about technology-enhanced teaching. In E. Ivala (Ed. ), Proceedings of the 8th International Conference on e-Learning (Vol. 2; pp. 215-223). Jimoyiannis, A. (2010). Designing and implementing an integrated technological pedagogical science knowledge framework for science teachers’ professional development. Computers& Education, 55(3), 1259-1269. Joyce, B., & Showers, B. (2002). Designing training and peer coaching: Our needs for learning. Alexandria, VA: ASCD. Lee, E., Brown, M.N., Luft, J.A., & Roehrig, G.H. (2007). Assessing beginning secondary science teachers' PCK: Pilot year results. School Science and Mathematics, 107(2), 52-60. Lock, J.V. & Redmond, P. (2010). Transforming pre-service teacher curriculum: Observation through a TPACK lens. In Proceedings of ASCILITE-Australian Society for Computers in Learning in Tertiary Education Annual Conference 2010 (pp. 559-564). Luehmann, A.L., & Frink, J. (2009). How can blogging help teachers realize the goals of reform-based science instruction? A study of nine classroom blogs. Journal of Science Education and Technology, 18(3), 275-290. McCrory, R. (2008). Science, technology and teaching: The topic-specific challenges of TPCK in science. In B. Cato (Ed. ), The handbook of technological pedagogical content knowledge (TPCK) for educators (pp. 193-206). New York, NY: Lawrence Erlbaum. Mishra, P., & Koehler, M.J. (2006). Technological pedagogical content knowledge: A framework for integrating technology in teachers’ knowledge. Teachers College Record, 108(6), 1017-1054. Mishra, P., Koehler, M.J., & Kereluik, K. (2009). The song remains the same: Looking back to the future of educational technology. TechTrends, 53(5), 48-53. Niess, M.L. (2005). Scaffolding math learning with spreadsheets. Learning and Leading With Technology, 32(5), 24–25. Petko, D., Egger, N., & Graber, M. (2014). Supporting learning with weblogs in science education: A comparison of blogging and hand-written reflective writing with and without prompts. Themes in Science and Technology Education, 7(1), 3-17. Riveros, A., Newton, P., & Burgess, D. (2012). A situated account of teacher agency and learning: Critical reflections on professional learning communities. Canadian Journal of Education, 35(1), 202-216. Robertson, J. (2011). The educational affordances of blogs for self-directed learning. Computers& Education, 57, 1628–1644. Sawmiller, A. (2010). Classroom blogging: What is the role in science learning? The ClearingHouse, 83(2), 44-48. Shulman, L.S. (1987). Knowledge and teaching: Foundations of the new reform. Harvard Educational Review, 57(1), 1-23. Sparks, D., & Hirsh, S. (2000). Strengthening professional development. Education Week, 19(37), 42, 45. Trucano, M. (2005). Knowledge maps: ICTs in education. Washington, DC: Information for Development Program. Van de Pol, J., Volman, M., & Beishuizen, J. (2010). Scaffolding in teacher-student interaction: a decade of research. Educational Psychology Review, 22,271-296.